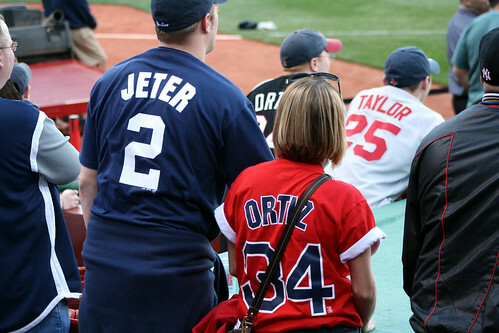 Split Decision - Cursed To First - Sox and Pats forever. Before this series began, predictions and declarations were made -- the Red Sox needed to take at least three out of four to have a meaningful remainder of the season, I heard at least one commentator say last Friday during the pregame show. The four-game set in the Bronx was hyped and framed as the whole enchilada, ball of wax, you name it, THIS WAS THE WHOLE SEASON, RIGHT HERE. If they'd been swept, sure. I could see sticking in the proverbial fork after such a thing. And obviously winning the series would've been a huge boost to the ego, a solid enough foundation to build renewed optimism upon. But reality, as usual, turned out to be somewhere in the middle, with a wild card (so to speak) thrown in. The Sox took the first game of the series handily behind a solid outing from Clay Buchholz on Friday night, as footage of Dustin Pedroia running on the Yankee Stadium infield was shown. "Looking at him, you can tell he's still thinking about it," said Tito afterwards, reporting that Pedroia was found not to be game-ready after the brief set of sprints from one baseline to the middle of the infield. And it's true. We were provided a closeup by NESN shortly after that quote from Tito, of Pedroia in conversation with a teammate behind the dugout fence, but looking away every so often toward the camera he didn't realize was zooming in. He stared off, clearly preoccupied, between the intermittent bursts of words tossed over his left shoulder toward whomever he was talking to, stroking the Youk-style beard he's grown. Still. Being on schedule may feel behind schedule to Pedey, but it's encouraging for the rest of us. Combined with the win on Friday night, there was plenty of fuel for optimism as the weekend arrived. On Saturday, which featured the weakest pitching matchup for the Sox going in -- Lackey / Sabathia -- the game most thought Boston would lose turned out as expected. That, in turn, led to a dramatic showdown on Sunday night, with the pitcher you'd historically want most on the mound in such a game starting for us in Josh Beckett. It's unfair, really, to put so much meaning onto a single game, as plenty of the groundwork for the team's tenuous position in the standings was laid well before it came down to this. It is even more unfair, I thought as I watched Beckett implode against the Yankee lineup again, to place THE ENTIRE REST OF THE SEASON on one particular pitching start. Does it really mean he's singlehandedly blown THE ENTIRE REST OF THE SEASON? Still, it was difficult not to cast about for someone to blame as the Sox continued to take an embarrassing beating from the Bombers. Difficult not to quibble, for example, with a lineup that sat Mike Lowell while starting Kevin Cash, who made a boneheaded throw to third in the bottom of the fifth, tacking another run onto the Yankees' haul that inning. Difficult, also, not to picture the faces that should've been there, and not to dwell on the woulda coulda shouldas. In that vein, I can only imagine what instincts seized Dustin Pedroia as he watched Bill Hall airmail a ball past V-Mart on what could've been a spectacular out in the bottom of the second. Or what might've been on Varitek or Youkilis' minds when Cash tossed the ball into left field*. In the meantime, off in the Great White North, there was that wild card -- the Rays collapsed over the weekend in Toronto, losing five straight between last Wednesday and yesterday, including a sweep at the hands of the fourth-place Jays. Yesterday they even came close to being no-hit for what would've been the third time this season, only escaping that indignity vs. Brandon Morrow with two outs in the top of the ninth. All of this rendered the series with New York much less significant, as the Red Sox retained their toehold in the Wild Card standings thanks to the Rays' losing streak. And then finally, today, behind 6 1/3 strong innings from Jon Lester, the Sox squeaked by with a series split in a 2-1 win. And so, as momentous as this series was predicted to be, its outcome -- status quo, 6.0 games out of first place and 4.0 games out of the Wild Card -- leaves more questions than answers. And to tell you the truth, I'm not sure what's supposed to be decided here, even as I'm sure I've been made to feel as if something should be. Even if the Red Sox had gotten swept, meaning we could all officially "give up", what does that really mean, in the end? None of us watch baseball games for the rest of the summer? How unrealistic is that? * We had some clue about Pedroia's reaction last night, as ESPN's cameras focused on a commotion in the Red Sox dugout. John Farrell had Pedroia in a headlock next to the Gatorade coolers, clapping a hand over Pedroia's mouth (well, actually, his entire face) and hollering something at Tito, who approached with what could only have been a pithy response. ESPN remarked that Pedroia is driving the coaching staff crazy in the dugout**; I can believe it. Last night it looked like his last ounce of self-restraint had given way, at least temporarily. ** Meanwhile, I have also wondered if the prominent presence of Pedroia and Youkilis in the dugout following their injuries -- Pedroia has made a point to travel with the team and take treatment wherever they happen to be playing, and Youkilis will return to as soon as possible following his hand surgery -- has been a kind of tacit editorializing vis a vis Ellsbury-gate. I still find the suggestion that Ellsbury was at fault for the team's losses earlier this month because he was absent when he could allegedly play a load of hogwash, but seeing Pedroia and Youk act as they have, I am willing to concede there could also be a nugget of truth at the heart of all that drama. I almost think the same about Pedroia and Youk re: rehabbing with the team (and Tek, of course, but was there ever really any doubt about where Mr. Captainpants would be?)... but at the same time, Pedroia has an injured foot and Youk has an injured hand. Extremities. Youk can run, Pedroia can kneel and take grounders like a maniac. Fractured ribs are a very different beast. And remember that Jacoby DID try to come back and play through it, which ended up making it worse and probably prolonging his rehab in the end, after that it was like he wanted to get far away from the team so he wouldn't be tempted to come back too soon again and start the whole thing over. And, like... these guys are morons, but they aren't MORONS, they realize this. idk, idk. I HAVE A LOT OF THOUGHTS.